Menopause is a normal part of every woman’s life. However, you don’t have to suffer through the symptoms caused by the changes in your hormone levels. 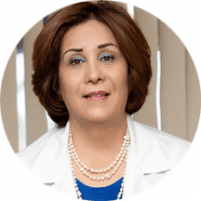 Mahin Amirgholami, MD, FACOG, at West Hills OBGYN in West Hills, California, provides treatments to help you get through menopause with ease, offering both traditional and bioidentical hormone replacement therapy (HRT). Call today or schedule an appointment online to learn more about your treatment options for menopause. For women, menopause is a natural part of your aging process and marks the end of your fertility. You officially reach menopause when you’ve gone 12 months without your period. On average, most women in the United States reach menopause in their very early 50s, although some women may undergo this change in their 40s. Dr. Amirgholami also offers exercise and nutritional counseling, as well as screening and treatment for osteoporosis. What symptoms will I experience during menopause? Before you officially reach menopause, your hormone levels begin to fluctuate, which may cause a number of symptoms. For some women, these symptoms can affect their quality of life. The hormonal changes also affect your menstruation, which may cause your period to be shorter or longer. You may even skip menstruation for several months in a row before you reach menopause. What is hormone replacement therapy (HRT)? HRT is a treatment for women that helps manage the symptoms caused by menopause. Most women only take estrogen, but in some cases, you may need combined therapy with estrogen and progestin. Many women have concerns about HRT because of its links to the development of blood clots and increased risk of heart disease. Dr. Amirgholami only recommends HRT after a thorough examination and review of your medical and family history. If she considers you a good candidate for HRT, she’ll prescribe the lowest dose possible for the shortest period of time to minimize any risk. In addition to relieving your symptoms, HRT may also keep your bones strong and healthy and reduce your risk of osteoporosis. Bioidentical HRT is an alternative treatment for traditional HRT. Bioidentical hormones are made from plants, such as soy or yams, and modified so they act like the hormones in your body. Like traditional HRT, bioidentical hormones also relieve your menopausal symptoms. You may prefer bioidentical HRT over traditional HRT as it offers a natural, plant-derived source of hormones. For expert management of your health during menopause, call West Hills OBGYN, or book an appointment using the online booking button.